From the Swiss makers of the Micro Kickboard Scooter that’s either been terrorizing or taking 80 countries by storm, comes this: the ultra tiny Italian built Microlino micro EV car. It goes into production and they’re taking orders about now, deliveries to be taken sometime next year. 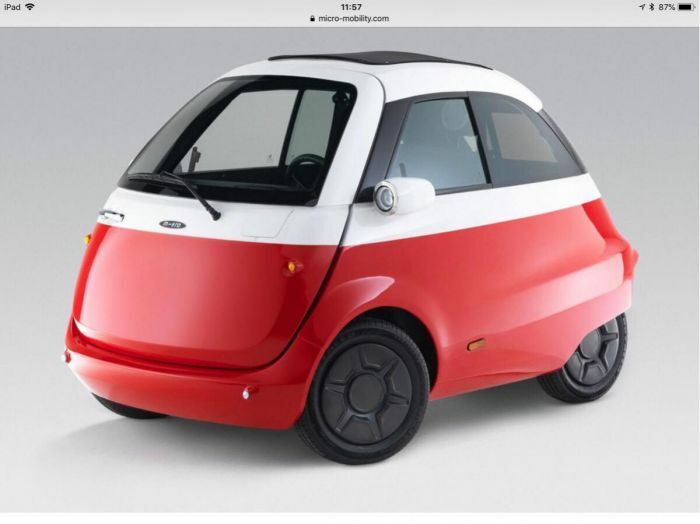 Loosely based on and perhaps inspired by the mid-last century BMW Isetta, it takes the whole concept of “bubble cars” or microcars to another level started by SmartforTwo. It’s smaller than a SmartforTwo but weighs a little less than a Harley Davidson Electra Glide Classic. It costs about 10 grand less than the Harley. Like the Harley, it has seating for two, but unlike the Harley, it has only one door for both occupants to get in and out. It has four wheels surprisingly, the rear track axle way skinnier than a Home Depot shopping cart, the rear tires almost as skinny as the front tires of a Skinny Demon Hellcat! And with that, it has the potential to pick up where the little Isetta left off. And it’s doing it in the same back yard with the EU’s permission. MSRP of Microlino: USD $14,043.00. Weight: 990 lbs. (No battery or people). Top speed: 55 mph 0-30 mph 5 secs. Battery/Range: 8 kWh/75 miles and 14.4 kWh/133 miles. Charging: wall socket, regular DC 4 hours, Type 2 in 1 hour. From the distance it looks like a little toy. As the design was going to prototype, the designers went to social media to make decisions by consensus, like the color choices. The car’s concept was based on the bubble car. After WW 2 in the 1950’s as Europe was still struggling to come out of a devastating war, the ways and means of living in Europe had to catch up to a more acceptable standard of living. Many could afford to get a bicycle or a scooter, but a car was out of the grasp of many, so solutions developed. One of them was known as the “bubble car.” The bubble car was the first beginnings of what we now call a micro car, and the first ones were probably somewhere in between a classic Mini Cooper and a few decades after that, the SmartforTwo. The BMW Isetta was a trail blazer, a 3 wheeled, one front door loaded only scooter car that you can park sideways at a curb, and get out the front onto the sidewalk. From 1955-1962, the tiny 1 cylinder engine gas car was sold all over Europe and went on to South America, and in the end about 162,000 were made and sold. The Microlino is smaller than a SmartforTwo. It is based upon the Isetta, but with an updated chassis and suspension. And with the advent of world automotive electrification, electrifying such a platform makes a pretty convincing case. No super charging is really required, a Type 2 can do it while a European is having a siesta in an hour’s time, or you can plug it into the house socket or garage wall outlet overnight for 4 hours. It’s size almost makes it mandatory to be an urban car, but with a range of at least 75 miles and a top speed of 55 mph, you can occasionally take to the interstate, well, perhaps in a pinch, and not worry about the whole world passing you by, like you had to with the Isetta, just some of it, the faster ones. It has about 10 cubic feet of storage in the back, and a sunroof. I see vents on the dash, I don’t think that’s a/c. Speaking of dash, the dash seems to go out with the door behind it, when you open it, the steering wheel too, unlike the Isetta. It just passed a round of safety tests, believe it or not, according to Curbed, and has been approved for use on European roads. No word anywhere I saw online about US sale. What do you think of this sheet Italian built microcar? Let us know in the comments section. For a super cheap urban runabout, it has promise. 75-133 miles range is more than reasonable for a grocery-getter. I have doubts that the Microlino will pass safety requirements for highway driving in the U.S. but it would easily qualify as a NEV (neighborhood electric vehicle), which are restricted to drive around, and can only up to 25MPH. If it were allowed to be registered as a normal car then it's 55MPH top speed would make it totally useful for most city driving. It's a fairly close copy of the Isetta, however I have driven a real Isetta and even though it is brazen fun, it is a gutless, tiny, tinny, rattling beast. But it was designed primarily to be super cheap, basic, enclosed transportation. And if they can build the Microlino as cheap as they promise, and make it street legal, it could be a hit here in it's niche market.